The Curandero is a traditional Native healer that in Mexico is still the primary healthcare providers in many isolated communities, faraway to main cities and hospitals. 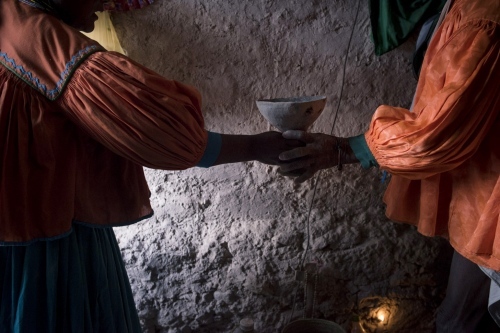 All around the country different kinds of “curanderos”, shamans, psychic continue to exist and to be important in their communities. These pictures have been taken all around Mexico, from Oaxaca’s rural areas, Sierra Negra in Puebla, Mexico City and Chihuahua, in the Narcos’ land, where Raramuri people live. 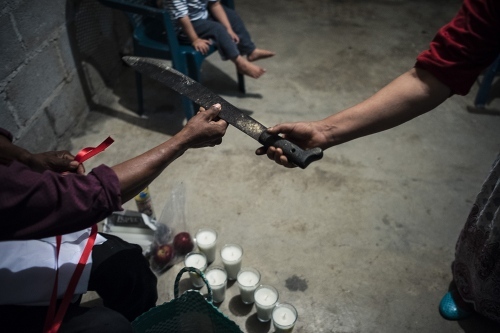 This indigenous group excels in running competitions worldwide, but to the authorities, they're becoming known for something else: as they’re settled in Narco-traffickers’ lands, they’re now exploited to grow up and smuggle drugs to the US. Raramuri are a simple, spiritual, family-oriented, agricultural people, who aim to live in peace and harmony with nature, their whole life revolves around the earth and the environment. 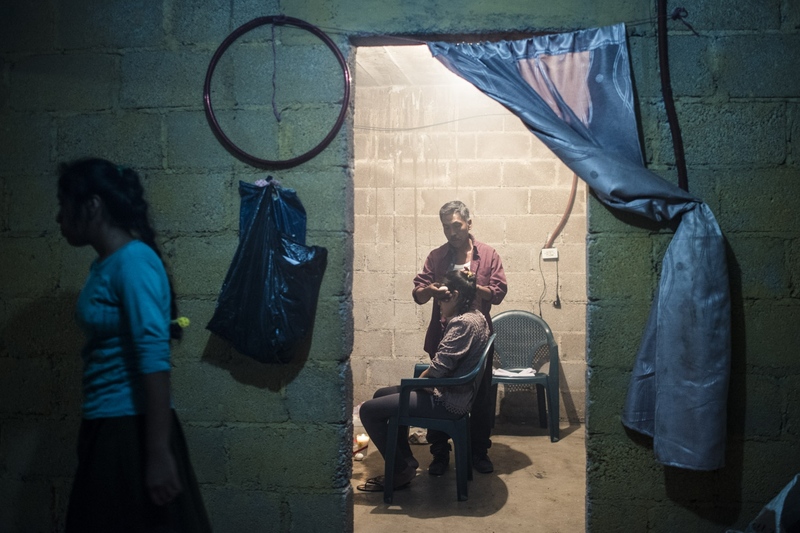 But there is no job, they repeatedly suffered drought, famine and other environmental crises due to the climate change and the powerful Sinaloa Cartel in charge doesn’t help them to go out from their isolation and poorness. These people have no choice and the only way to heal themselves is to consult a Curandero, the indigenous medicine that have survived after the colonisation and has been handed down from generations. 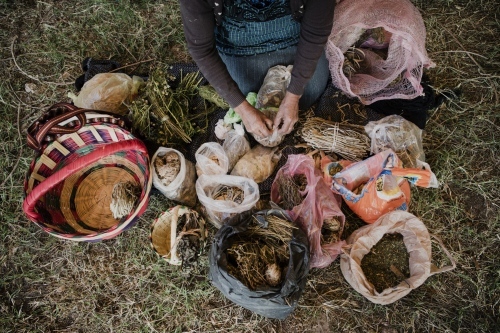 The basis of curanderismo derives from the shamanistic practices of local indigenous cultures, often blended with the Christian conquer’s principles, but now we can find significant Native American herbal therapies and traditions included in the first west world pharmacopeia. The curanderos are not doctors, their approach to the pathologies suggests the patient to use remedies and medicinal herbs and to look at the disease in a metaphysical way, as if it were provoked by a trauma, a displeasure or even, according to them, by supernatural origins. Spirit of viper in Sierra Negra, Zoquitlan, Puebla. In the high mountain’s communities faraway to main cities and hospitals this strong drink is still used to heal viper’s bite and as natural antibiotic for many diseases. 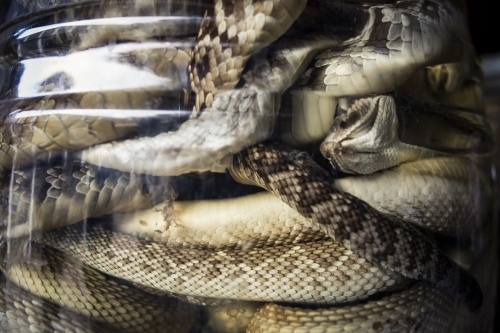 In ancestral culture the snake is an important symbolic animal so this is not just a physical healing. Liliana in her house in Mexico City. She’s a medium and healer, she works with natural elements, prayers and going into a trance to find out the answers from their spirit helpers. An isolated hut where an entire family lives under a sheet metal roof supported by four sticks, in a small village of Raramuri people called Munerachi, in Chihuahua. The region has a very high poverty rate and they are two days faraway from the first hospital. They heal themselves just with ancestral practices, they interlace religious lore, magic, and careful observation of nature. A temazcal is a type of sweat lodges in a circular structure which originated with pre-Hispanic Indigenous peoples from the Nahuatl word. 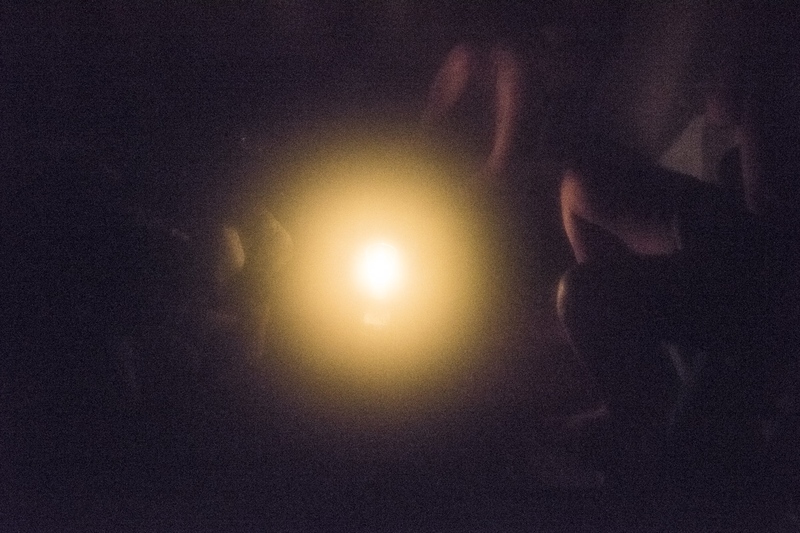 It’s a curative ceremony thought to purify both body and spirit and to heal sickness. Tehuacan. 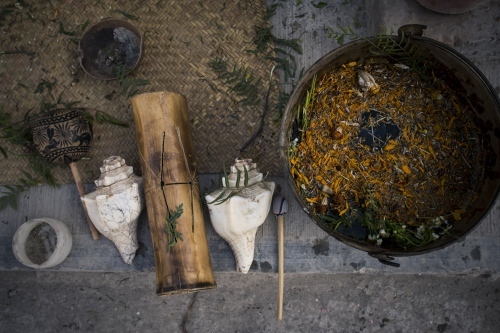 Instrument, herbs and tools used in the Temazcal ritual. Tehuacan. 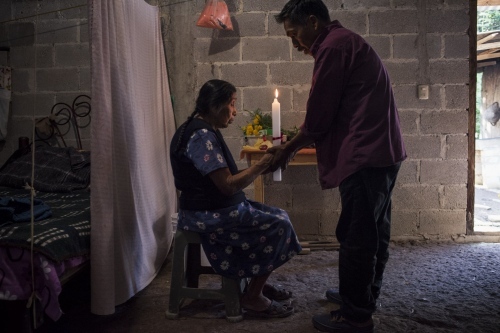 The curanderos Mario Cubas is protecting a peasant woman in her house from the evil eye. 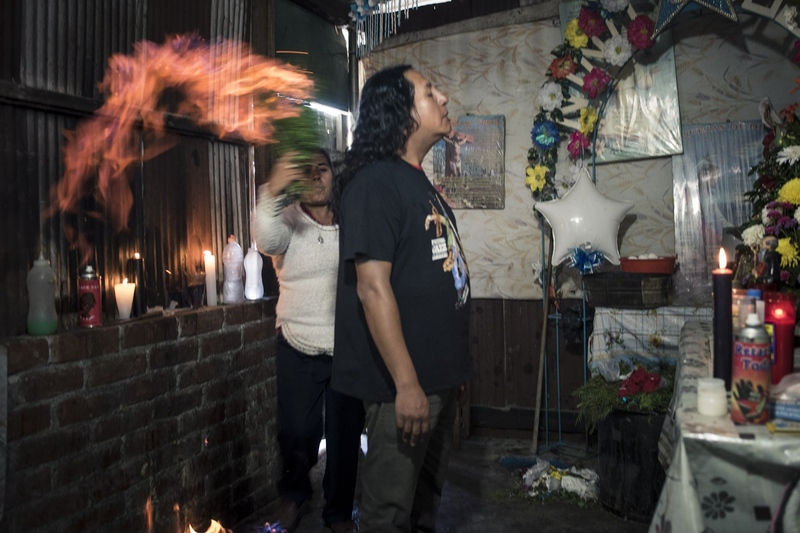 The curandero is the only person who has the skills and ability to fight off mal de ojo (the evil eye), or even to put curses on someone: “as exists good and bad in the world, somebody works in white magic and somebody else in black one”, said Mario. During the Limpia ritual an object like herb, egg or sometimes an animal is used to absorb and eliminate negative energy from the patient. Then it’ll be buried, burned or disposed of far away from the victim. 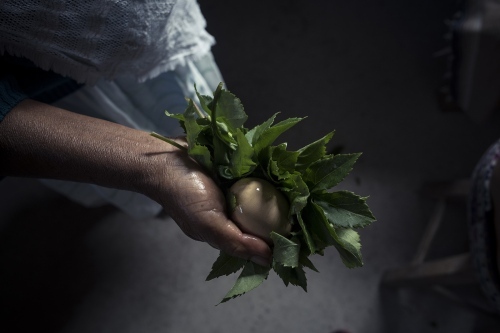 The healer Maria Engracia Vazques is helping Yolanda to recover after the loss of her son a few years ago with special plants and an egg. To heal from trauma, an illness or a curse the curandera may perform a Limpia ritual, in which an object like an egg is used to absorb negative energy from the patient. Then it’ll be buried, burned or disposed of somewhere far away from the patient. The curandera Edit has a gift, she told her mission is to heal people. She discovered it in very you age, after an accident in which she lost temporarily consciousness. After several years healing secretly from her husband she finally could impose herself and open her own healing centre. She has a lot patients who come from all over the world. Nahualt indigenous ritual of the Siembra de Nombre, based on a dance of several hours. 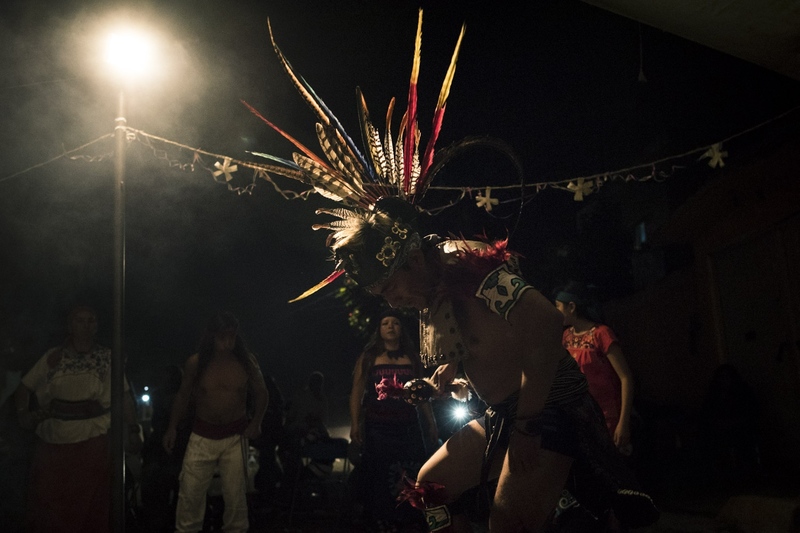 The dance in the indigenous culture is a way to connect with nature and universe and in this way to heal. 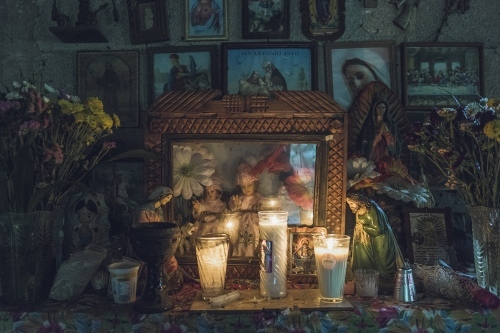 The curanderos Mario Cubas is protecting a woman house supposely invaded by spirits. 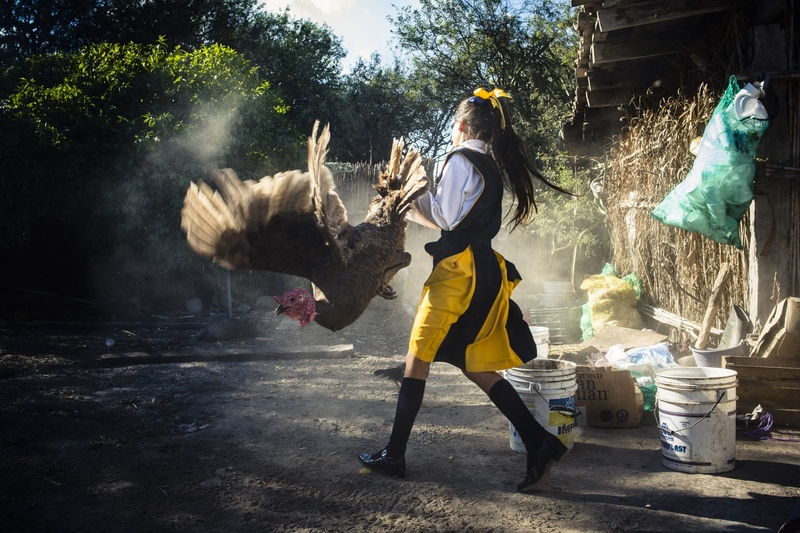 Belen in her backyard is playing with a turkey after school. 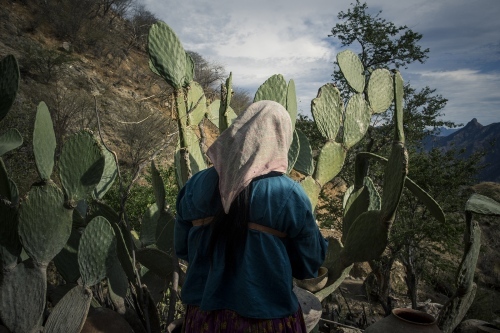 Animals for own consumption are the first means of subsistence for many families in the rural Mexico. Somentimes they are sacrified as offering. Rosa is a traditional indigenous healer from Tehuacan. 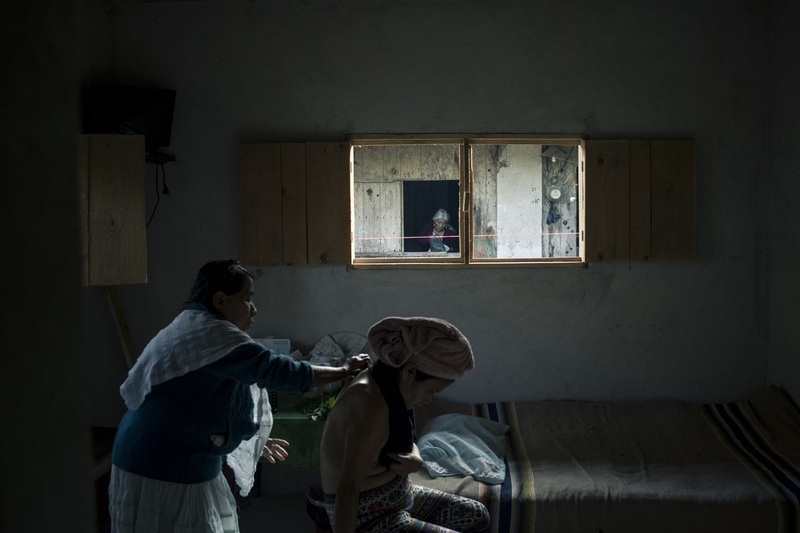 The curanderas, they’re often women of special competences, have to look at their patient as an all-encompassing physical, spiritual, and emotional level. They heal when the illness is provoked by a trauma or a displeasure or has even supernatural origins. Rosa uses Temazcal, a typical sweat lodges in a circular structure which originated with pre-Hispanic Indigenous peoples from the Nahuatl word. It’s a curative ceremony thought to purify both body and spirit and to heal sickness. 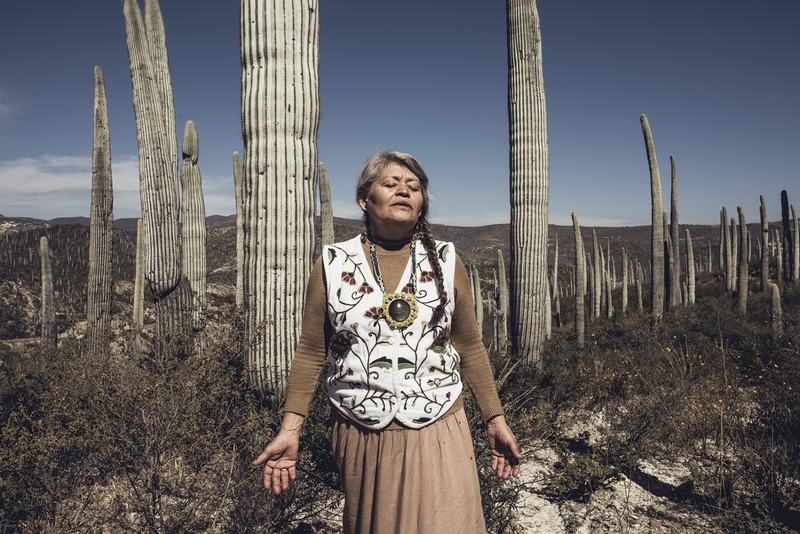 Rosa is also an activist for indigenous rights and asks her patients to reconnect with their lost traditions and the power of nature. 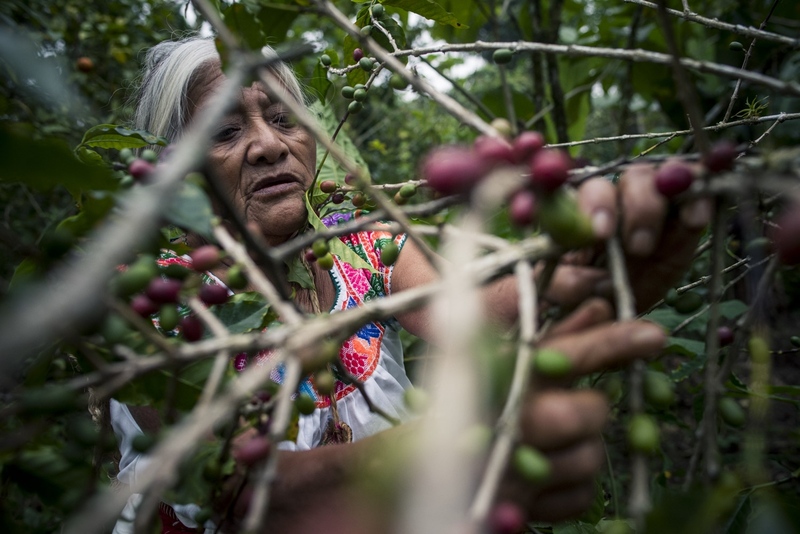 Micaela Perez, the yerbera in Cuetzalan, Sierra Norte, Puebla. 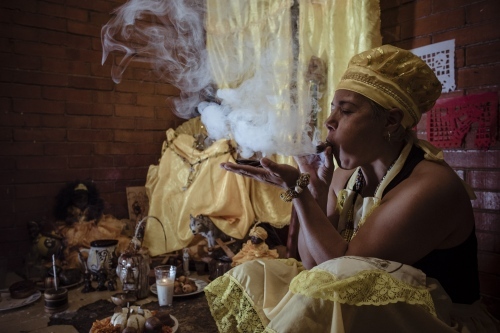 She heals prescribing herbal remedies, including teas and poultices, or plant blends for smudging and burning. She also help woman to give birth. She learnt from her grandmother, she started watching and helping her when she was 10 years old. 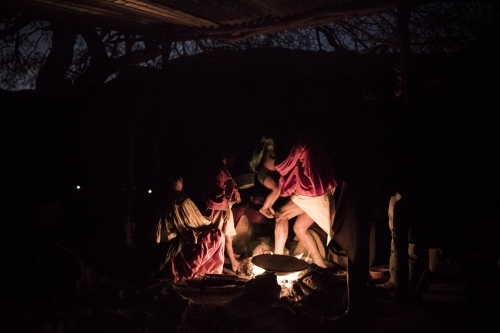 Raramuri family gathered around a fire in the eveninig. Their house is an isolated hut in a small village called Munerachi, made of a sheet metal roof held by four sticks. 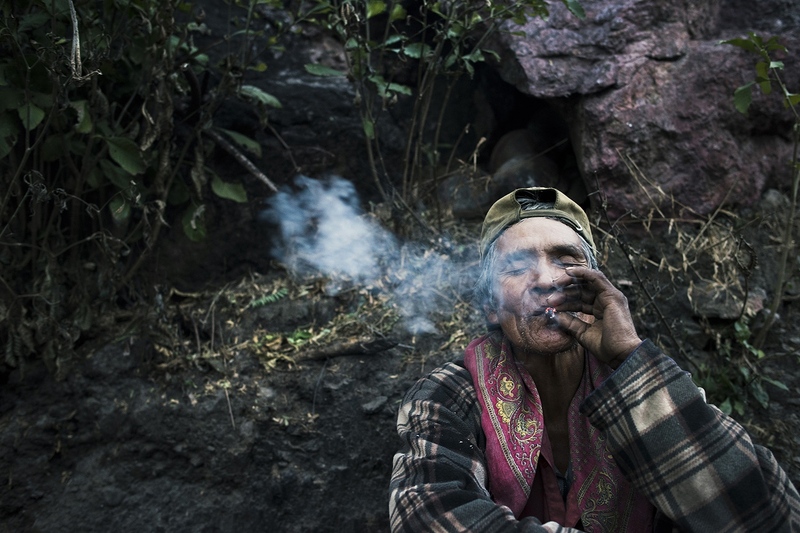 Tarahumara people in Salvial village, Chihuahua. They live very isolated and don't are used to interact with withe people. He's Venancio is the one in charge to heal the whole village. He's healing his doughter. 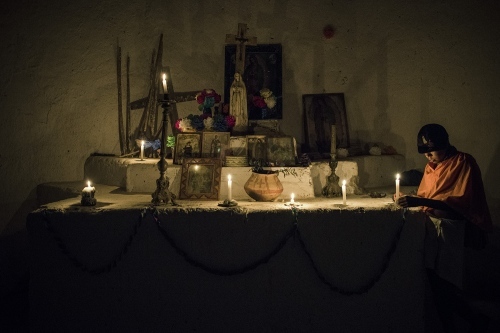 A Raramuri boy keeps the candles alight during the Virgen the Guadalupe celebration that lasts the whole night. 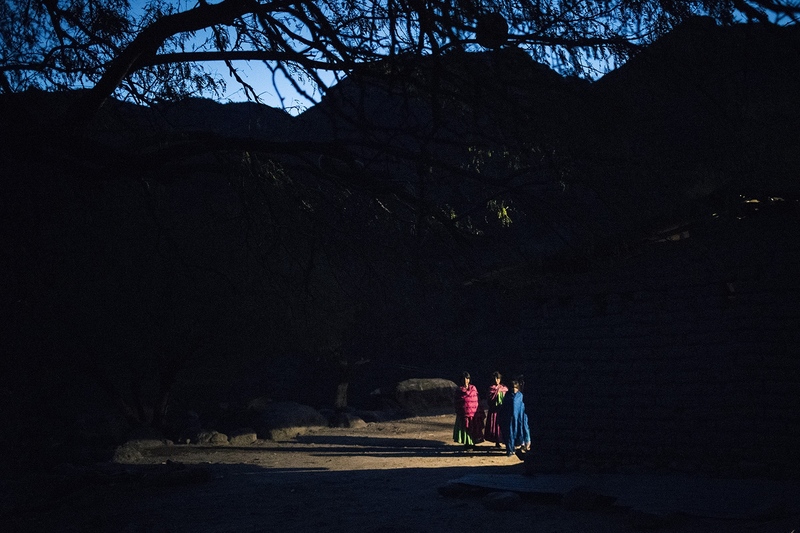 Raramuri sisters with their little brother playing volleyball in front of their house, a sheet metal roof supported by four sticks. The small village is called Munerachi, in Chihuahua. 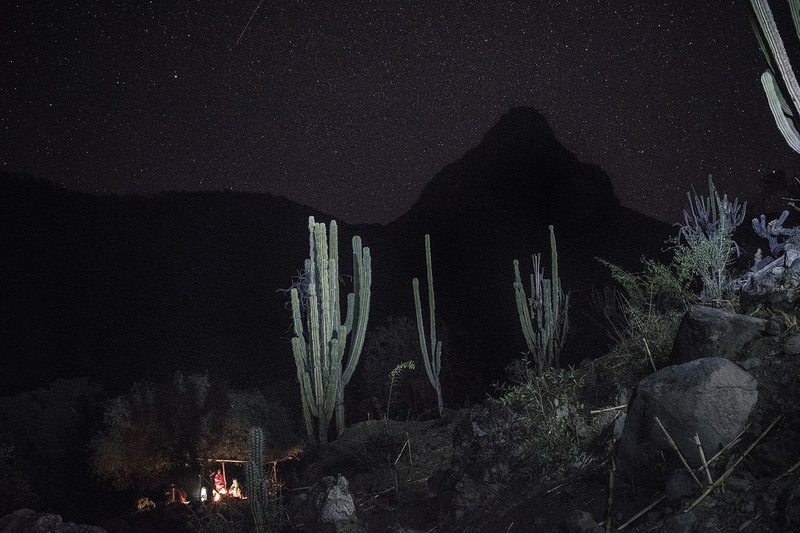 Munerachi village, baja Tarahumara, Chihuahua. Three sisters in front of their house at the dawn during the Virgen of Guadalupe night.